Chinese calligraphy is the term given to the art form of the creation and writing of some of the world’s oldest symbols: Chinese characters. Chinese script is one of the oldest forms of writing in existence. In 4000 BC, the ancestors of today’s Chinese people created marks recording their lives and labors in relationship to the natural world; these marks were then carved or fired into pottery. Composed of linear patterns, the carvings are the earliest examples of embryonic pictograms expressing abstract thoughts. Over the following thousands of years, a great variety of fascinating Chinese characters and styles evolved and, simultaneously, the art of calligraphy. Chinese calligraphy represent not merely words, but the culture, art and history of China as well. Calligraphy was the most highly-prized of oriental art forms. Throughout the history of the East, great intellectuals, writers, poets, and doctors, were often great calligraphers as well. 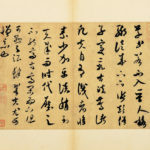 The famous saying in China, “Chinese characters reflect the man”, explains the long-held Chinese belief that just a single page of calligraphy reveals the secrets of its writer’s character. The study of Chinese calligraphy is an excellent means of self development and achieving inner harmony. 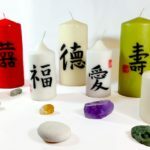 Central to Chinese culture through the ages is the ancient Daoist concept of Qi, the belief that in order to fully express true inner feeling and spiritual insights it is necessary to attain a balanced combination of correct breathing and better circulation with mental and physical activities. 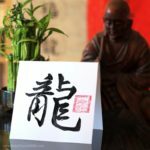 Throughout the centuries, the traditional way to achieve a state of spiritual content is through the regular practice of the art of calligraphy. As we clear our minds and quiet our hearts, while grinding a pool of fragrant ink, sitting upright with a straight spine and breathing smoothly and deeply, we begin to express our hearts entirely through the soft tip of the brush and to steep our hearts to overflowing in this ancient heritage. Once you are used to the practice, you may be able to express your innermost feelings through this art form. In place of the frenzy, noise, and pressures of modern life, you will begin to achieve tranquility, harmony, and balance, and you will benefit both mentally and physically. Technique – It is all about using Your mind to guide a brush and express Your inner self into character on the paper. Abstract lines become alive with artistic expression which is free, but in same time still within boundaries of clear defined brush techniques. Structure (character’s composition) – It’s all about structure and the relation between the strokes of each character. Only careful consideration of all aspects of prioritization, concession and coherence of the components, structural symmetry and harmony of the character can be achieved. Layout – It’s overall arrangement for the whole piece of calligraphy – balance of the space between characters, the distance between the lines, the allocation of characters. The fragile balance between black (ink) and white (paper) representing the yin – yang relation between void and concretion and ultimately leads to harmony and perfection. 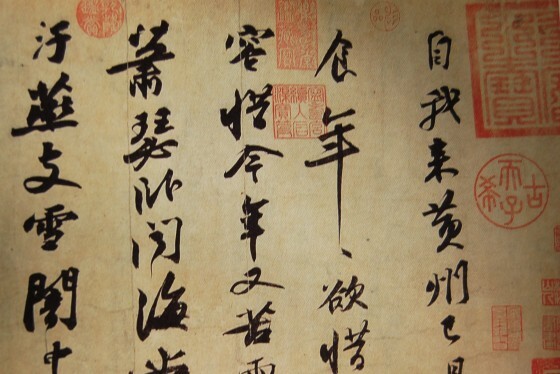 The “scholar objects”, materials of calligraphy, consisting of ink, brush, ink stone, and paper have been known in China for thousands of years as The Four Treasures. Calligraphers developed a ritual of laying out the materials in set positions, using the preparation at the time to meditate on the work to come. Paper – In the way that the brush is an extension of the artist’s heart, paper is the vehicle of the artist’s heart blood. Calligraphy paper varies in size, texture, and absorbency, but any surface that holds ink adequately – even newspaper – is suitable for calligraphy. Of the different types of paper available today, Yuan Shu and Mao Bian is paper are both good for calligraphy. Although sometimes referred to as grass paper, the major fibers of these papers are bamboo, straw and bark. There are three main paper finishes: unsized or raw (Sheng Xuan), semi-sized (Ban Shu), and sized (Shu Xuan). These range, respectively from very absorbent to minimally absorb. Brush – The brush is an extension of the artist’s heart, becoming part of the artist, who then expresses through the tip of the brush. Brushes are defined by the characteristic of their hair: Sharpness of bristle, Evenness – same length of the hairs, Roundness and Resilience of hairs. Ink – Ink and brush are looked upon as twins, because they always work together. The main ingredients of proper ink sticks are soot mixed with glue along with preservative, fragrance and dozen additional ingredients. The type of soot used defines an ink. Ink from oil soot gives warm black color and make it good general-purpose ink. Pine soot ink is cooler, blue-black, it’s good for for calligraphy and meticulous styles of painting. Ink Slab – Scholars treasure their ink stones as if they were best friends, one who remains loyal for a whole time. The purpose of the ink stone is to grind the solid ink to produce a usable liquid for painting and calligraphy. A good ink stone is solid and smooth and produces ink quickly without damaging the brush.